Welcome to this month's Constellation Showcase! This monthly segment details a currently viewable constellation, typically somewhere along the ecliptic. This month we're going on a tour of Aquarius, the water bearer! The star chart at right shows Aquarius and some surrounding constellations and celestial objects. The red line is the ecliptic, the path the sun and planets follow through the sky. 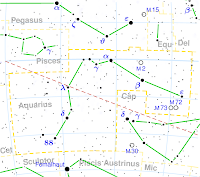 In the Northern hemisphere, Aquarius can be seen to the South and mid-way to the zenith (although this will vary with your latitude). Although I can't see the resemblance, Aquarius represents the water-bearer of the same name from Greek mythology. It is also said that the constellation Eridanus is a river being poured out from Aquarius' water pitcher. Let's take a look at some of the features of Aquarius! Our first deep sky object in Aquarius is the globular cluster M2, also known as NGC 7089. The Hubble Image seen at left is, of course, far more than you'll be able to see in a backyard telescope, but it gives a good idea of how dense this cluster really is. On a clear, dark night, M2 is sometimes visible to the naked eye! This cluster is approximately 175 light-years wide, and slightly over 37,000 light-years away from Earth. M2 was actually discovered accidentally by Jean-Dominique Maraldi in 1746 while he was observing a comet with Jacques Cassini. The cluster is estimated to be 13 billion years old, making it one of the oldest globular clusters in the Milky Way. Another globular cluster in Aquarius is M72, also known as NGC 6981. M72 isn't as nice in backyard telescopes as M2, but is still worth a look. M72 is actually very difficult to resolve to anything more than a faint fuzzy, even in 10" telescopes. Telescopes 10 inches and larger will begin to resolve stars around the edges of this cluster. This is because M72 is actually beyond the center of the Milky Way galaxy, and we must view it through all the intervening matter. With the galaxy being over 50,000 light-years away, it is one of the most remote clusters in the Messier list. This distinction makes it a nice target to bag. Another odd thing about this cluster is that it is relatively young. Most clusters contain old stars, but this one contains several young, blue giant stars. The Saturn Nebula, officially known as NGC 7009, is a planetary nebula. This nebula was created when a low-mass star suddenly transformed into a white dwarf star. The green cloud seen in the Hubble image at left is the remnants of the star's outer shell. Also note the jets of gas that can be seen stretching out to either side of the nebula. These jets are where the Saturn nebula gets its name, since these jets give the nebula what appears to be a false set of edge-on rings. Interestingly, no one knows the actual distance to this nebula, so there are no distance or diameter measurements. There are simply no reference stars around the nebula. The distance is theorized to be about 2,000-4,000 light-years, however, which would give an associated diameter of about 0.4-0.8 light-years. Perhaps the most famous deep sky object in Aquarius, however, is the Helix Nebula. The Helix nebula is also known as NGC 7293. This nebula looks eerily like an eye peering back at us through space. In fact, it has been commonly called the "Eye of God" in several chain e-mails. The resemblance to an eye is purely coincidental, however. The coloration in this Hubble image is also false, and is generated by taking images at different wavelengths. Like the Saturn nebula, the Helix nebula also formed at the end of a star's life cycle, as the host star shed its outer shell. The star at the center of the Helix Nebula is also in the process of transforming into a white dwarf star. It is estimated that this nebula formed about 10,600 years ago.